The weather in Bahrain has been chilly and rainy lately, so all I’ve been having for dinner these days is a huge, piping hot bowl of soup. I like to eat it with a hunk of warm crusty bread, the kind that’s crunchy on the outside but soft and chewy in the middle… yum! 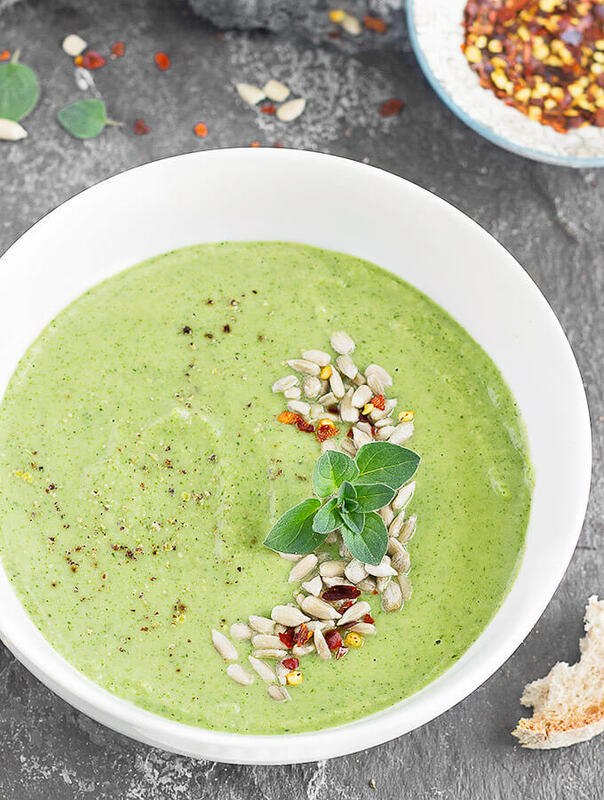 Broccoli white bean soup is the perfect quick-fix dinner for chilly nights. It’ll make you feel warm and cozy, but it’s easy to prepare and doesn’t take much time to cook. What’s more, it’s so rich and hearty, you won’t believe how nutritious it is! 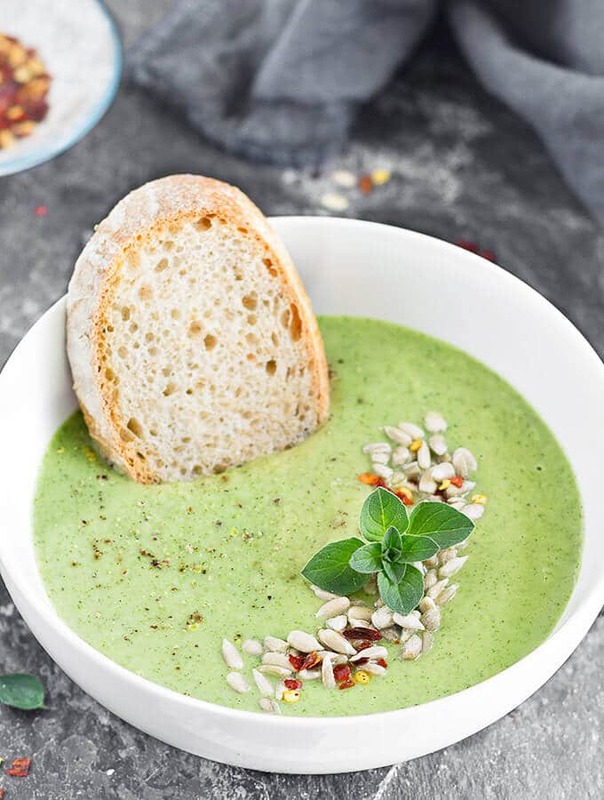 Made with broccoli, cannellini beans, and spices, this soup is dairy-free, gluten-free, and vegan, making it the perfect meal for anyone who has food sensitivities or just likes to maintain a healthy lifestyle. On hectic weekday nights (or any night, really! ), you can whip up a pot of this soup in about 15 minutes. Simply sauté the shallot and garlic in a pan, then add the broccoli, white beans, and vegetable stock. The broccoli add a beautiful color to the dish, while the beans make it thick and creamy. 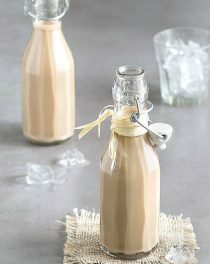 Because the softened vegetables blend so smoothly, there’s no need to add milk or fat-filled cream to the recipe. I like to use as few dishes as possible, so I puree the ingredients right in the pot with an immersion blender. You could even use a blender or a food processor, if that was easier for you, just remember to be careful when pureeing hot liquids! If your soup is still too thick after blending, thin it out with some more vegetable stock. If it’s too thin, bring it back to a simmer and cook it until it’s reached your desired consistency. Once the soup is ready to be served, you can get creative with garnishes! I like sprinkling mine with sunflower seeds, chili flakes, and fresh oregano. You can experiment with other spices and herbs, or use chopped nuts. 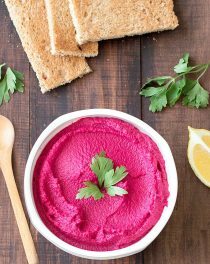 Pair it with different breads, crackers, or even tortilla chips to dip into your bowl. 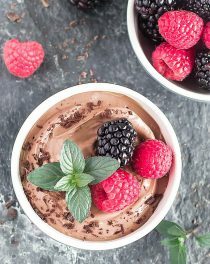 If you’re not following a vegan or dairy-free diet, try swirling in a dollop of sour cream or plain Greek yogurt, or top it with shredded cheddar cheese. Leftovers can be stored in an airtight container in your refrigerator for about 3 days. I like using this soup for packed lunches because it makes a filling meal — just heat, and bon appétit! If you or anyone in your family is health conscious but loves warm, rich comfort food, you’ll find yourself making a pot of this delicious, nutritious soup again and again! 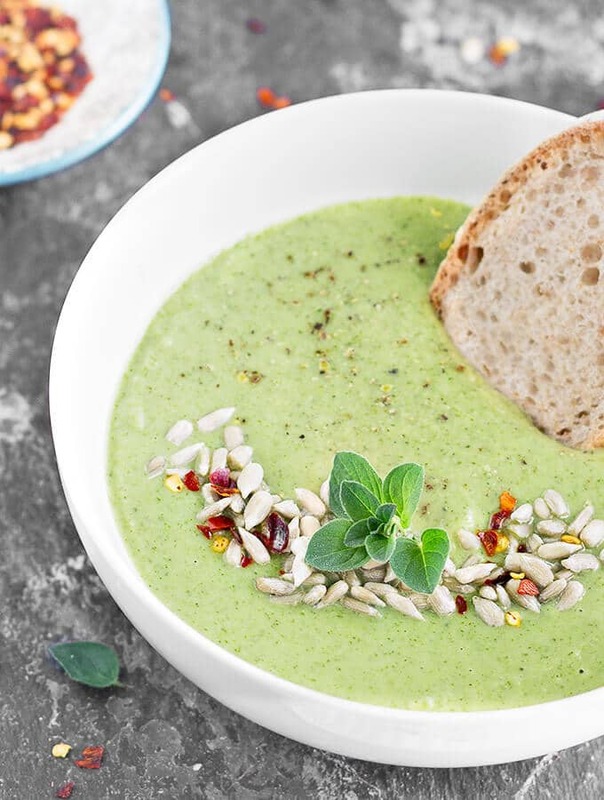 Give this simple broccoli white bean soup a try and let me know what you think. Leave a comment, rate it, and don’t forget to take a picture and share it on my Facebook page or tag it #aseasyasapplepie on Instagram! I love seeing what you come up with! Heat the oil in a large pan over medium heat, and sauté the shallot until soft. Add the garlic and sauté for 1 minute or until fragrant. Add the broccoli, beans and vegetable stock. Cover and simmer until the broccoli are tender. This will take about 5 minutes. Season with salt and pepper. Using an immersion blender, a blender, or a food processor, blend the soup until completely smooth. 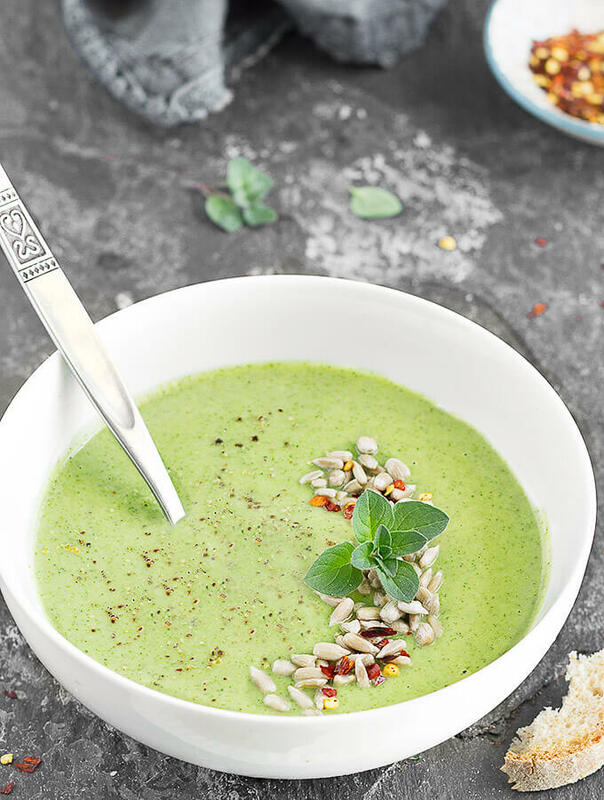 Serve this creamy broccoli white bean soup in bowls garnished with sunflower seeds, chili flakes, fresh oregano, and freshly ground black pepper. Soup can be stored for up to three days in the fridge in an airtight container, or in the freezer for up to one month. Delicious! It’s a cold, snowy day here in New York and we just had this for lunch! Even my picky four year old liked it! I was skeptical but this soup is really good and it’s super quick and easy to make! 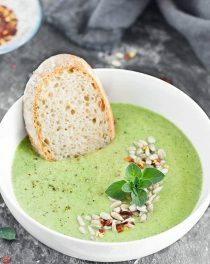 Love the protein from the beans in a creamy broccoli soup! We had this for lunch today. I used chicken broth and small white beans (what i had). Super tasty!! A great base too if you want to switch out the broccoli for something else. We will definitely have again. Glad you enjoyed it, Stacia! Quick, easy & delicious! Thank you! 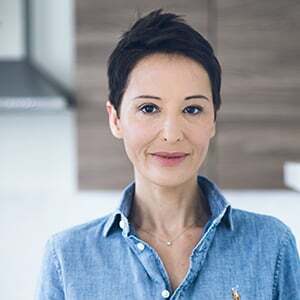 I am glad you liked it, Nadine! Seriously loved this soup! It’s just as good reheated, as well, which makes it perfect for lunches!!!! I’m about to make another batch right now!